→The use of Transformers in Transformer coupled Push Pull AMPLIFIERS make it bulky and expensive especially in this age of Integrated circuits. →Another drawback of the circuit is that it needs two out of Phase signals which necessitates an input tapped transformer or phase inverter, and thus makes the circuitary quite complicated. The above two Drawbacks can be easily solved by using COMPLEMENTARY SYMMETRY PUSH-PULL AMPLIFIER. This arrangement uses two transistors having complementary symmetry (one transistor is PNP and the other is NPN). The term complementary arises from the fact that one transistor is N-P-N type and the other is P-N-P type. They have symmetry as they are made with the same material and technology and are of same maximum rating. The resistors R1 and R2 provide the voltage divider bias to forward bias the Emitter-Base Junction of transistor Q1 and Similarly Resistors R3 and R4 provide the voltage divider bias for Emitter junction of transistor Q2. The Resistors are so selected that under zero signal condition, the operating point is cutoff and so no collector current flows. The signal applied at the input goes to the base of both the transistors. 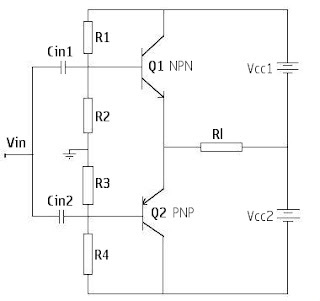 The two transistors conduct in the opposite half cycle of input signal, the NPN transistor Q1 is forward biased and conducts while the PNP transistor Q2 is reverse biased and so doesnot conduct. This results in a half cycle of output voltage across the load, resistor Rl. 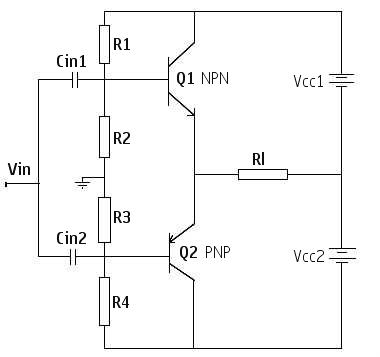 Similarly during the negative half cycle only the PNP transistor Q2 is forward biased and conducts which develops second half cycle of the output voltage across the Load Resistor Rl. Transistor Q1 being reverse biased and doesnot conduct during the negative half cycle of the input signal. 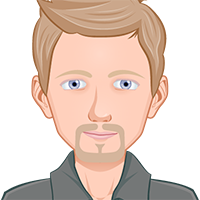 Thus during a complete cycle of input, a complete cycle of output will developed. →Harmonics will develop if there is any Unbalance in the two Transistors.